(# 21) I had these little red end pieces I just couldn't throw away. (#5) I just liked this fabric. 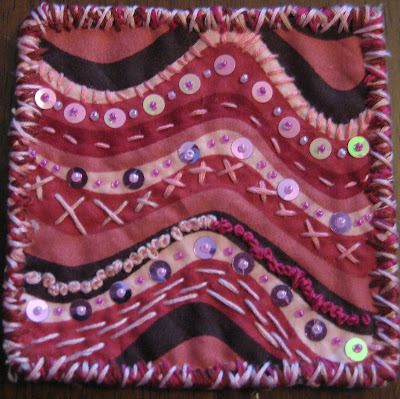 And decided to just play with thread, beads, and hand quilting. Thanks so much for visiting with me. Beautiful! So glad you found me! Your work is gorgeous and inspiring. Hope you have a great weekend! Hi Sandie, I love all your quilties! The roses and yoyos quiltie is so cute and your art journal is wonderful! You do inspire me sweet lady! I absolutely love the butterfly journal and the red button square. You make me want to start making quilts. I actually made a quilt way back in high school. It was shades of blue velvet in a 3D square design. it was a cover for my bed. The quilt was beautiful, but sooo much work! Too much cutting and sewing for me. I do have a passion for fabric, though. Hey sweetie!! The quilties look great in the photos!! I like the one with the house and the blue kitty! Too cute! Have a great day and I'll see you this week! I just realized that I didn't pop over to see the crochet?? But I don't see it. Oh I love the idea of the journal quilts, they are so much fun to look at and what fun it must be to play with them. Love, love, love the fabric roses! I like the other quilties too. Journal quilts are a great idea to play with techniques on a smaller scale. Greetings from SBM! What a gorgeous idea! I especially love the yo-yos one! I love the butterfly quiltie! I love the kitty/house quiltie. (which is totally not surprising given my cat love). You should make a book or a postcard collection! Sandie - thanks for visiting my blog from the Small Blog Meet - here is my return! I am DIGGING the #13 with the roses. Please please please show me how you do those? Tutorial!! !